For that matter, it could be difficult to determine exactly what this book IS about. It is a story of a group of “gods” who have a constantly-changing story of creation being enacted and retold as it is unfolding. It is a strange trip of a book, often going in circles but adding a bit more each time to continue the story. It may possibly also be “Mr. Toad’s Wild Ride” now that Disney World closed that ride, but we would not know that unless a severed bard head told us. 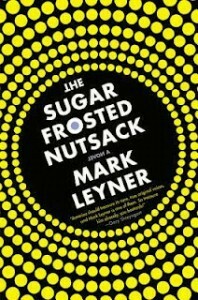 So, why did I select The Sugar-Frosted Nutsack as my book review this week? Well, sometimes you simply need to support creative people who use hockey as non-integral parts of their narratives. Plenty of books illustrate a scene with a baseball game or a soccer match as background. However, it has been my experience that authors rarely use hockey as a random reference. In TSFN, Mark Leyner gives more than one totally “out there” hockey references – professional and minor league – that simultaneously seem out of place and yet important to the story. I will be honest – this book is not for everyone. It reads like a Tom Robbins meets William S. Burrows meets Tom Stoppard wild goose chase looking for a Chuck Palahniuk book once regurgitated by Hunter S. Thompson (in one blurb on the back cover, Walter Kim called it “A wild, psychedelic digression of a novel that brings chaos to order…Reading it is like roller-skating backward up a disintegrating spiral staircase composed of millions of fluttering small moths. Except that it’s also like a thousand other things, none of which – I guarantee it – you’ve ever know or experienced before.) During some scenes, it can be vulgar; during others, completely inane. Often, readers will simply chuckle at the absurdity. But back to the hockey – and I will give away one of the hockey parts in case a book like this does not appeal to you. In discussing the god XOXO, Leyner writes: “Once, he gave Pittsburgh Penguins center Evgeni Malkin a concussion during a game at Mellon Arena, and although Malkin’s body (his ‘mortal husk’) lay unconscious on the ice for about ten human-minutes, XOXO actually ‘kidnapped’ Malkin’s soul and took it to his garish hyperborean hermitage miles beneath the earth’s surface…served Malkin’s soul drugged sherbet, which made Malkin’s soul woozy and disinhibited enough that it agreed to be dressed up in a U.S. Marines tank top and PVC diaper briefs.” (17) There is more to the Malkin story, but I did not want to spoil it completely. Yes, those of you who are firmly in the anti-Pittsburgh camp are probably laughing hysterically at the thought of Evgeni Malkin dressed in PVC diaper briefs right now (and so are a few Penguins fans, I would imagine). Others are probably wondering who reads a book by someone who even thinks up these types of scenarios – besides me, the dust jacket also quotes actor John Cusack and author Jay McInerney as fans, so I seem to be in good company. This book is a total distraction from your teams losing in the first and second rounds of the playoffs. Once again, my two favorites – the Blackhawks and the Predators – were taken out by the same team in back to back rounds (excuse me while I jump onto the LA Kings bandwagon), so forgive me for taking a brief solace in a crazy book. Next week, it’s back to hockey books. I promise. For me, it is always a pleasant surprise to find hockey mentioned in a story that has nothing to do with hockey. What other books have you read that use hockey as a non-integral scene in the story?